A step-by-step course that shows you exactly how to bridge your past career to your first tech job, designed by a career changer for career changers. Let me show you how to get your foot into the door of the tech world, even if you don’t know exactly what your dream first tech job is right now. Focus on telling your story, making the connection between your past and your future crystal clear, and then shortcut the application process through building relationships. What are the non-negotiable and nice-to-have criteria for your first tech job? How to your career change as a natural outgrowth of what you’ve done before? What experiences have you had in the past that will help prove that you can do your dream job? What kind of experiences or skills do you need to get to get yourself to that dream job? What do I have to do to become the person I want to be? Who do you have to be to land the job you want? What makes tech interviews different from those of other industries? When and how to ask for what you're worth--even if you're afraid! This cheatsheet helps you pick the best job opportunity among all of your options if you want a systematic way to make your decision and reduce the stress of decision-making. You've got the job, now it's time to build a solid reputation. This checklist shares exactly what you should be doing on your first day, week, month, and quarter at your first tech job if you want to create a stellar first impression that will pave a smooth path for the rest of your time there. If you haven’t heard of the impostor syndrome, it’s when you fear everyone will find out about you being a fraud, even if you have solid skills. How can you work with these feelings while you are job hunting as a beginner in tech? 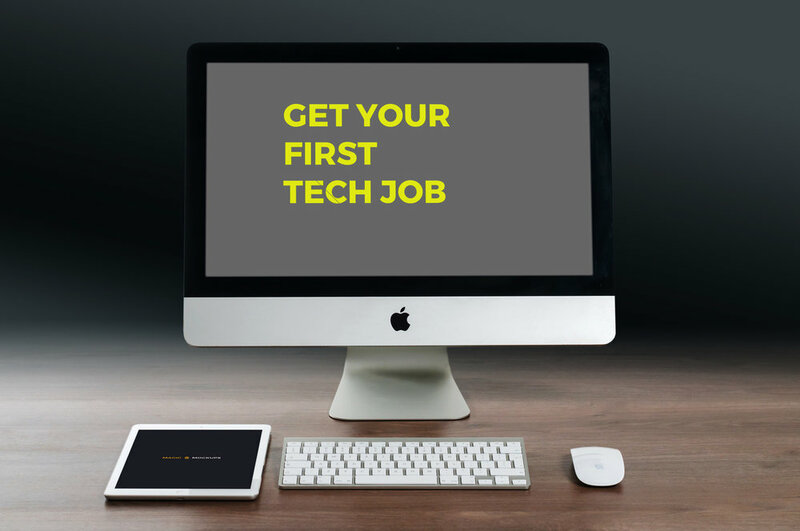 Ready to get your first tech job? Live Q&A community coaching call with me, each week for 4 weeks. I’ll be online on camera, answering any and all of your questions LIVE . If you can't make a call, you can submit your questions ahead of time, then you'll get the recording ASAP. Limited time offer! Register today and you'll receive a free 60-minute 1-on-1 coaching call to dive into your unique situation. Only 3 offers remaining! This course will be open in early September when you'll get an email giving you access to the members-only site. One module will be released each week, but you will have lifetime access to all the modules. The pre-launch early bird price is $97. The full price will be $197. + How much time is involved in completing the course? Everybody will work through the course at their own pace, but I recommend between 2-3 hours per module or week. If you take full advantage of the community calls and the Slack mastermind group, add another 1.5 hours. The course starts when I release the first module on May X and ends on May X, a week after I release the last module. However, it can also be a completely self-paced course - you can decide how much time you need and when you finish. How does lifetime access sound? After enrolling, you have unlimited access to this course for as long as you like - across any and all devices you own. Also, I intend to improve this course over time, so you will get all the updates for free. If, for any reason, you're not satisfied with the course, contact me before the relase of the third module on May X, and I will give you a full refund. There’s only ONE condition: Please tell me the main reason you weren’t happy with the product, so I have a chance to make it better.